Head and shoulders top (shown on the left) is a bearish reversal pattern. Formation consists of a left shoulder, a head, and a right shoulder and a line drawn as the neckline. 1. The left shoulder is formed at the end of an extensive move during which volume is noticeably high. After the peak of the left shoulder is formed, there is a subsequent reaction and prices slide down to a certain extent which generally occurs on low volume. 2. The prices rally up to form the head with normal or heavy volume and subsequent reaction downward is accompanied with lesser volume. 3. 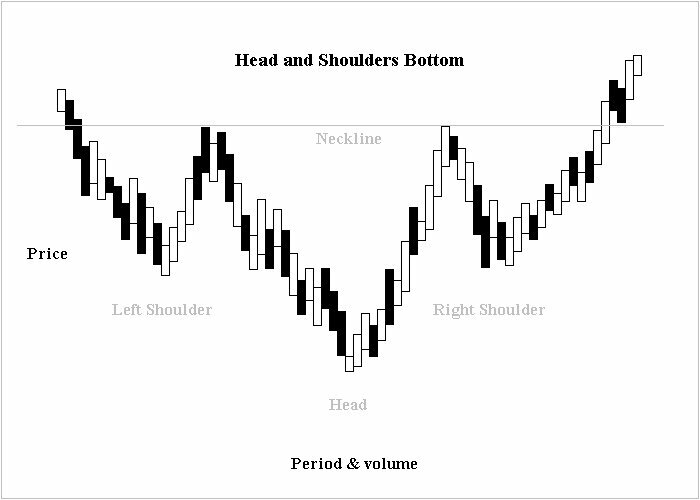 The right shoulder is formed when prices move up again but remain below the Head (usually at the level of left shoulder) and fall down nearly equal to the first valley between the left shoulder and the head or at least below the peak of the left shoulder. Volume is lesser in the right shoulder formation compared to the left shoulder and the head formation. 4. The neckline is drawn across the bottoms of the left shoulder, the head and the right shoulder. The neckline may slope upward or downward. A downward sloping neckline is more reliable as a signal. When prices break through this neckline and keep on falling after forming the right shoulder, it is the ultimate confirmation of the completion of the Head and Shoulders Top formation. It is quite possible that prices pull back to touch the neckline before continuing their declining trend. 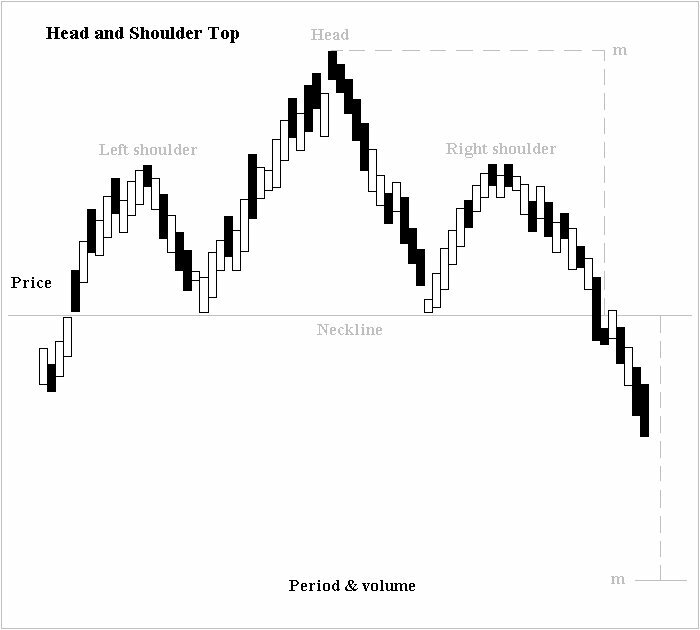 – most of the time Head and Shoulders are not perfectly shaped. This formation is slightly tilted upward or downward. – one shoulder may appear to droop. – on many chart patterns, any 1 of the 2 shoulders may appear broader than the other which is caused by the time involved in the formation of the valleys. – the neckline may not be perfectly horizontal; it may be ascending or descending.